Originally a mineral, the perovskite used in today’s technology is quite different from the rock found in the Earth mantle. A “perovskite structure” uses a different combination of atoms but keep the general 3-dimensional structure originally observed in the mineral, which possesses superb optoelectronic properties such as strong light absorption and facilitated charge transport. These advantages qualify the perovskite structure as particularly suited for the design of electronic devices, from solar cells to lights. The accelerating progress in perovskite technology over the past few years suggest new perovskite-based devices will soon outperform current technology in the energy sector. The Energy Materials and Surface Sciences Unit at OIST led by Prof. Yabing Qi is at the forefront of this development, with now two new scientific publications focusing on the improvement of perovskite solar cells and a cheaper and smarter way to produce emerging perovskite-based LED lights. Researchers from the Energy Materials and Surface Unit at OIST. From left to right: Dr. Luis Ono, Dr. Yan Jiang, Dr. Linquiang Meng and Prof. Yabing Qi. Perovskite-based solar cells is a rising technology forecast to replace the classic photovoltaic cells currently dominating the industry. In just seven years of development, the efficiency of perovskite solar cells increased to almost rival - and is expected to soon overtake – commercial photovoltaic cells, but the perovskite structure still plagued by a short lifespan due to stability issues. OIST scientists have made constant baby steps in improving the cells stability, identifying the degradations factors and providing solutions towards better solar cell architecture. The new finding, reported in the Journal of Physical Chemistry B, suggests interactions between components of the solar cell itself are responsible for the rapid degradation of the device. More precisely, the titanium oxide layer extracting electrons made available through solar energy – effectively creating an electric current – causes unwanted deterioration of the neighboring perovskite layer. Imagine the solar cell as a multi-layered club sandwich: if not properly assembled, fresh and juicy vegetables in contact with the bread slices will make the bread very soggy in a matter of hours. But if you add a layer of ham or turkey between the vegetables and the bread, then your sandwich stays crisp all day in the lunchroom refrigerator. A perovskite-based layer includes many layers, including for example the electrodes on both sides, and the perovskite in the middle. The addition of a polystyrene layer in-between prevents the titanium oxide layer to deteriorate the perovskite, but does not affect the overall power conversion efficiency. Credit: American Chemical Society (ACS). This is exactly what the OIST researchers achieved: they inserted in the solar cell an additional layer made from a polymer to prevent direct contact between the titanium oxide and the perovskite layers. This polymer layer is insulating but very thin, which means it lets the electron current tunnel through yet does not diminish the overall efficiency of the solar cell, while efficiently protecting the perovskite structure. “We added a very thin sheet, only a few nanometers wide, of polystyrene between the perovskite layer and the titanium oxide layer,” explained Dr. Longbin Qiu. "Electrons can still tunnel cross this new layer and it does not affect the light absorption of the cell. This way, we were able to extend the lifetime of the cell four-fold without loss in energy conversion efficiency”. The lifespan of the new perovskite device was extended to over 250 hours - still not enough to compete with commercial photovoltaic cells regarding stability, but an important step forward toward fully functional perovskite solar cells. 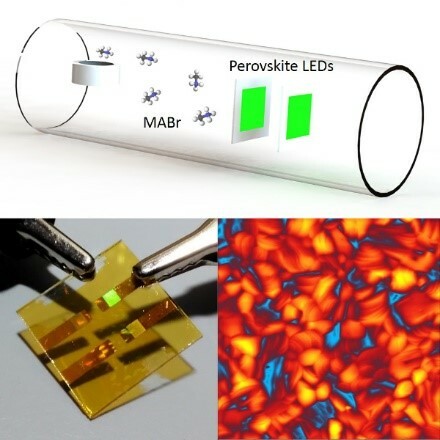 The manufacturing of these perovskite LEDs is currently based on dipping or covering the targeted surface with liquid chemicals, a process which is difficult to setup, limited to small areas and with low consistency between samples. 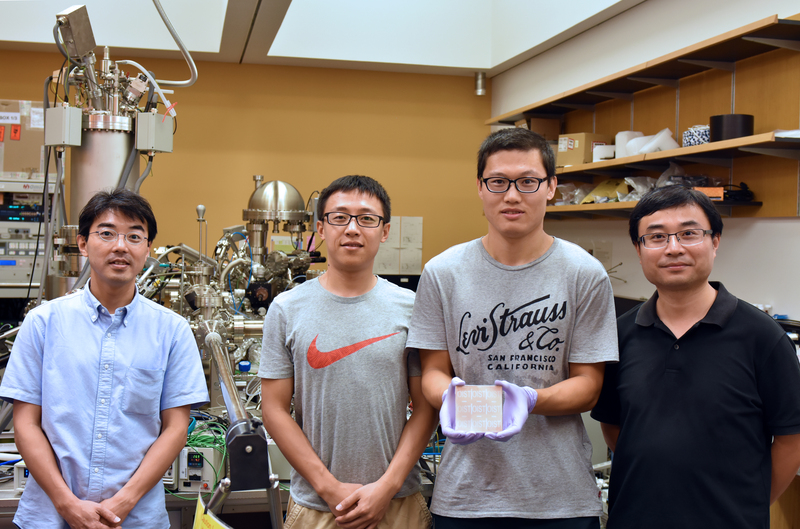 To overcome this issue, OIST researchers, in collaboration with Prof. Chihaya Adachi and Dr. Chuanjiang Qin from Kyushu University, reported in the Journal of Physical Chemistry Letters the first perovskite LED assembled with gasses, a process called chemical vapor deposition or CVD. Like the solar cell, the perovskite LED also comprises many layers working in synergy. First, an indium tin oxide glass sheet and a polymer layer allow electrons into the LED. The chemicals required for the perovskite layer – lead bromide and methylammonium bromide - are then successively bound to the sample using CVD, in which the sample is exposed to gasses in order to convert to perovskite instead of typically solution-coating processes with liquid. In this process, the perovskite layer is composed of nanometer-small grains, whose sizes play a critical role in the efficiency of the device. Finally, the last step involves the deposition of two additional layers and a gold electrode, forming a complete LED structure. The LED can even form specific patterns using lithography during the manufacturing process. Top: the perovskite LED sits in a furnace, where the Methylammonium Bromide (MABr) in gaseous form will be introduced into the system and deposit on the LED surface. Bottom left: a glass-based LED, glowing green when electricity is applied. Bottom right: size and shapes of the perovskite grains on the surface of the LED. Credit: American Chemical Society (ACS). This large perovskite-LED was produced using chemical vapor deposition and connect to a 5V current, illuminating through an OIST pattern etched on the surface. Credit: American Chemical Society (ACS).